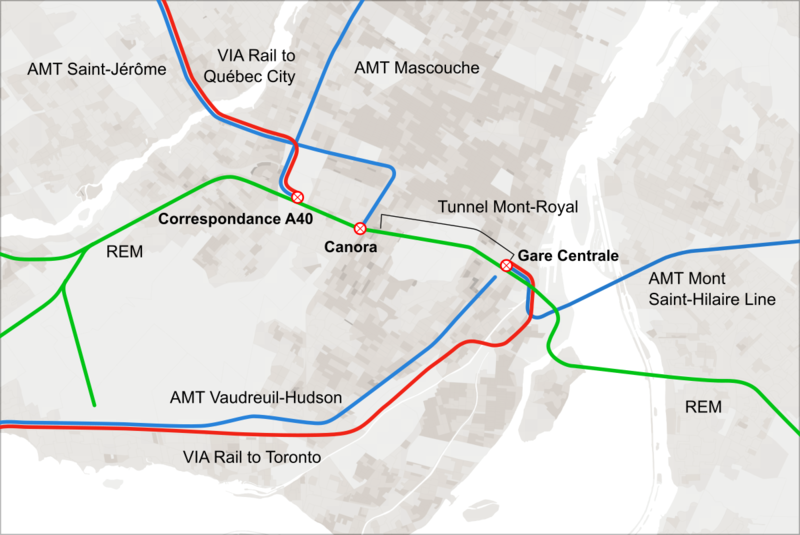 The CDPQ pension fund is proposing to privatize the main commuter rail tunnel going through Montreal, convert it to an automated light metro, and build several extensions to the suburbs. They are hoping for a large annual return, paid by public transit agencies. While it increases the size of the rapid transit network, the resulting medium capacity network deprives direct access to downtown for several heavy rail lines, and the suburban extensions are rather car-centric. At the provincial environmental assessment hearings (BAPE), I presented the above 100-page memoir. I also wrote several analyses on this blog, warning about the long-term impact of this project. 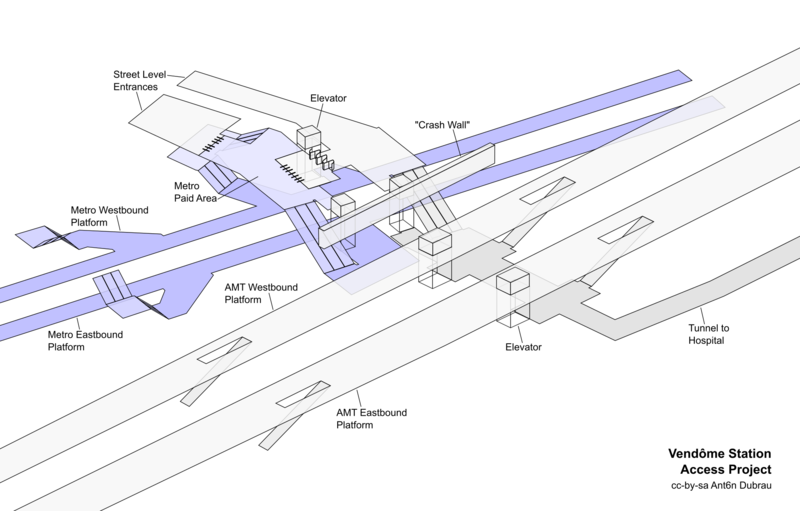 The STM Montreal is planning to build a second access for the Vendome Metro station, involving the construciton of a second concourse connecting the Metro, commuter rail, hospital and neighborhood. I went to the consultations to criticize the long transfer walks of the proposed design, and made several suggestions to improve the layout. 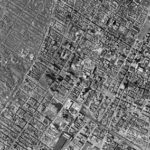 The city of Montreal published a high quality, complete aerial survery of the island of Montreal. The imagery comes in large non-orthorectified images, that have virtually no meta-data associated with them. So it is hard to find locations and browse around. This project combined a couple hundred of the images into a large view, which was rotated and tiled as to align it with modern aerial imagery. Shows populations near transit stations, as an indicator of potential ridership. This takes the locations of the transit stations from the agencies’ GTFS feeds, and combines it with population data from Statistics Canada. 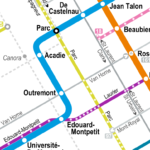 This map of the Montreal transit system includes the STM’s 10 minute network, as if it was rapid transit. This is due to the realization that frequent service can act as rapid transit from a user’s point of view, even if the service is provided by street-running buses. The whole system is shown geographically abstract, like one would expect from a rapid transit map. 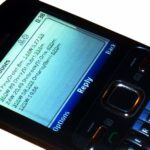 This provides a service where users can send an SMS to receive transit schedules. The innovation is that users only need to send their current address, which gets geocoded by the service. The returned answer will show all nearby bus departures, ordered by distance. One focus of this project is to have the result as compact as possible. 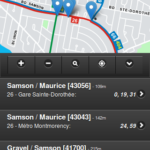 This is the prototype of a transit app, which I built for a transit app contest held by the STL. I won the “special mention of the Jury” prize for this. The innovation is that information is shown on the system’s transit map, rather than a car-centric map. Similar to the SMS app, it also attempts to show information in a compact way, and have an interface that requires very little interaction to get nearby schedules – one click. A project that overlays a 1941 transit map of Montreal with another from 2011. See how the city abandoned it’s trams and built a metro. Yet see how many transit lines remained the same.